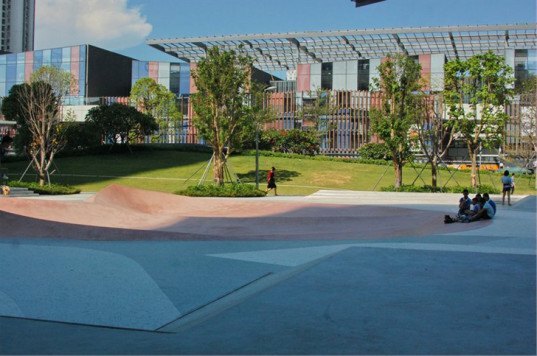 Refreshing fountains, interactive play areas and parks are some of the amenities of the recently completed Vanke One City project in Shenzhen, China. The project, designed by California-based 5+Design, incorporates a 200-meter-high office tower, a residential building, a five-star hotel, four pavilions and a three-level open air shopping center organized around a variety of green spaces. The project’s retail areas mimic the transition from forest to sea, as it gradually changes its structure and appearance towards the waterfront. This part of the development comprises buildings with ocean-inspired facades, while those located on the north side of the site reference the forest through the use of wood. 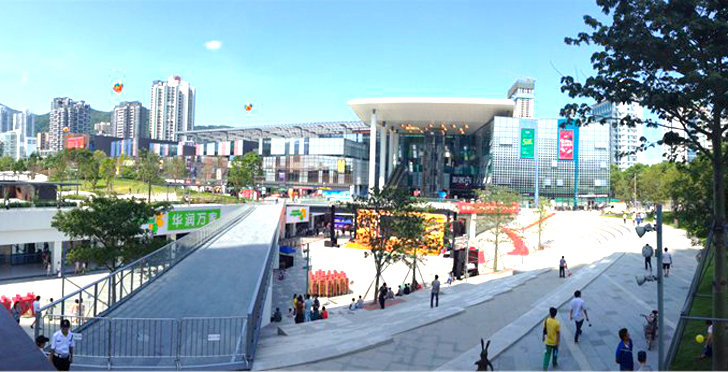 Vanke One City creates a mix of functions and spatial experiences and is programmed to “give people a variety of things to do.” It comprises fountains, an arena, an interactive play area for kids, and a centrally positioned recreational park programmed with active spots meant to engage pedestrians on their way to a retail, office or residential area of the complex. Buildings located on the north side of the site reference the forest through the use of wood. This part of the development comprises buildings with ocean-inspired facades. It gradually changes its structure and appearance towards the waterfront. The project’s retail areas mimic the transition from forest to sea.